What are Open Tunings? And what are they good for? How can you integrate them into your own playing? In the following series of articles I answer these questions,and also show plenty of great sounding riffs and licks for the most important Open Tunings that you can incorporate into your own Blues guitar playing immediately. All examples are taken from my new eBook ‘An Easy Guide To Open Tunings For Blues Guitar’, which contains many more examples and ideas (available at my website). If a guitar is tuned to an ‘Open Tuning’ playing the open strings results in a major chord (or less common in a minor chord). There are many open tunings, but by far the most common ones are ‘Spanish’ and ‘Vestapol’. Both terms stand for a relative tuning of the strings to each other, no matter what the actual pitch is. It’s not as complicated as it may sound. Before long things will get absolutely clear! … And What Is It Good For? The great advantage of open tunings is that you can play chords and melodies high up on the neck and all the open strings fit in with your root chord. The result is that for instance you can play a Steady Bass or an Alternating Bass on the open strings at the same time. You get a very full and resonating sound with very little effort. In an open tuning it’s relatively hard to hit a wrong note as long as you are on the root postion chord (that is the chord the guitar is tuned to). Each tuning has typical licks and riffs that create a certain sound typical for this particular tuning. Blues guitarists with a trained ear can tell in which tuning a certain song is played – just by listening to it! tuning down to ‘Open D’ or ‘Open G’. The A string and the D string are tuned two semitones higher and the g string is tuned one semitone higher. If you play the open strings while your guitar is in Open E tuning you’ll hear an E major chord, as if you were fretting the E major chord in standard tuning (E-B-E-G#-B-E). But ‘Vestapol’ doesn’t have to be Open E tuning. Open D tuning is also very common. As I wrote before the term ‘Vestapol’ determines a relativ tuning of the strings to each other, no matter what the actual pitch is. In Open D the distance from on string to the next is exactly the same as in Open E, just the absolute pitch is different (D-A-D-F#-A-E ). 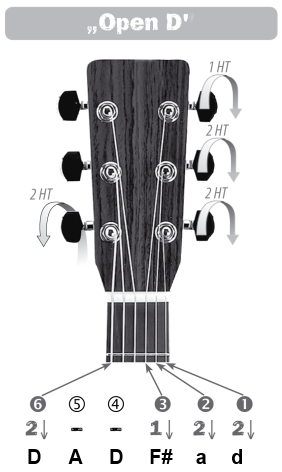 If you tune to Open D and put a capo on the second fret you get Open E. All the chord shapes, licks and riffs are played exactly the same way in both tunings, they just sound a little higher in Open E and a little lower in Open D.
It’s a very good idea to familiarize yourself with a new tuning by playing riffs you already know from standard tuning. 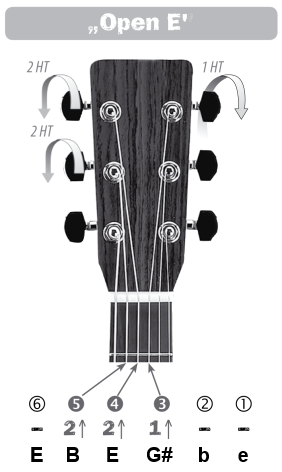 The note on the 4th fret could be played as a hammer on. Now try to play other riffs you already know from standard tuning in Vestapol tuning. Remember that the notes on the low E string, on the B string and on the high E string are still where they were in standard tuning. The G string is tuned one halftone higher so all the notes on the g string must be moved one fret lower. The A string and the D string are tuned two halftones higher so all the notes on these two strings must be moved two frets lower. Have fun! 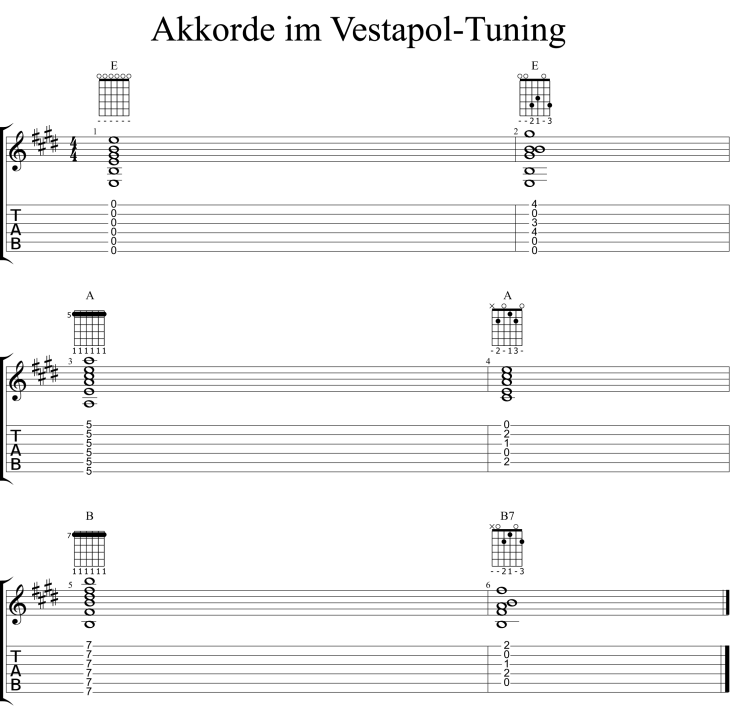 In the next article you’ll learn some great sounding must-know-riffs that work especially well in Vestapol tuning. Later we will look at other tunings as well. Stay tuned!